Located in the heart of the World Class Kapalua Resort, The Wine Palette is a modern and classy full-service bar with casual lanai seating and a hip lounge area to relax. Bring your appetite and try a few of our tapas selections from cheese and charcuterie, spinach artichoke dip, to grilled Panini’s and steak skewers. If you have time for an activity, try your hand at a game of chess, doodle on our unique chalkboard counter, or paint. That’s right….you can sip wine and paint. 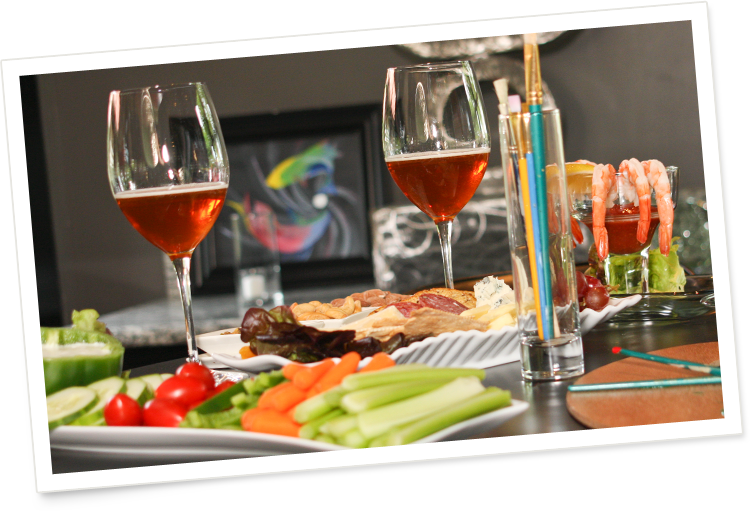 Choose a canvas, wine glass, or wine bottle to paint and our staff will take care of the rest. Whether you’re an avid artist or never touched a brush, the experience is sure to create a lasting memory. For the wine lovers, we have one of Maui’s finest selections. Our signature wine flights offer a great way to sample amazing wines. Don’t worry, we didn’t forget about the martini drinkers or beer connoisseur. We have something sure to please everyone in a fun and relaxed atmosphere. Visit www.the-wine-palette.com for our menu and special events.